A novel design for an anti-landmine shoe has been proposed by F.K. Fuss and M.A. Tan. The design of the robotic mine-shoe calls for a set of at least three support legs extending from a foot plate. An actuator at the joint of the leg; the actuator can either allow a load to be sustained, or, in the event that a mine is detected, can cause the leg to carry no weight. 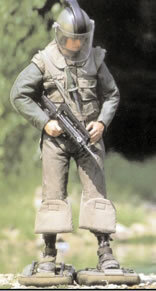 The weight of the plastic leg is not sufficient to set of the mine. The actuation of the support leg can be either passive (as described above) or active - raising the leg above the suspected mine. The authors estimate that the optimal set-up would involve six legs. In the prototype, the leg could respond in less than 30 milliseconds. Apparently, there really are anti-mine shoes; the Guartel Technologies Mine Shoes use the air cushions to spread the weight of the user across a greater area. 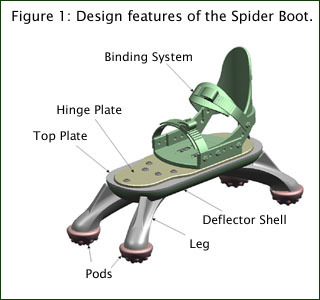 The MedEng Spider Boot is another effort with what appears to be a substantial amount of research behind it; it bears an obvious resemblance to the robotic anti-landmine shoe described above. It is estimated that from fifteen to twenty thousand people are killed or maimed by anti-personnel landmines every year; deminers are obviously subjected to terrible danger in the course of their work. Novel designs and new approaches are always welcome; more research and development are needed. Read more at Development of a Novel Anti-Landmine Shoe; found this story here.